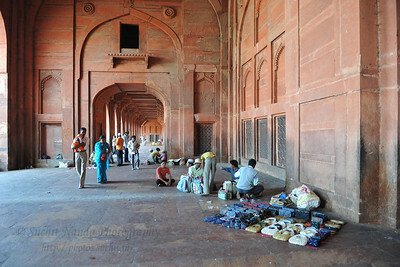 Buland Darwaza: One of the gateways to the Jama Masjid, is a stupendous piece of architecture. 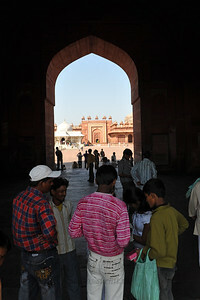 Fatehpur Sikri's main entrance is a lofty gate called Buland Darwaza. The Darwaza is 40 metres high and topped by pillars and chhatris. 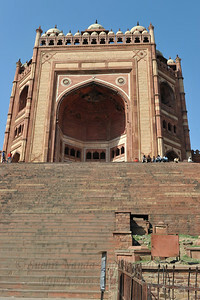 Buland Darwaza is considered to be the greatest architectural monument of Akbar's long reign. 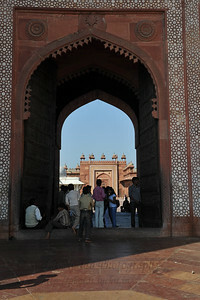 The Darwaza was built by Akbar in 1573 to commemorate the conquest of Gujarat. Fatehpur Sikri (Hindi: फतेहपुर सीकरी, Urdu: فتحپور سیکری) is a city and a municipal board in Agra district in the state of Uttar Pradesh, in North India. The historical city was constructed by Mughal Emperor Akbar beginning in 1570 and served as the empire's capital from 1571 until 1585. Though it took 15 years to build, it was abandoned after only 14 years of use because of shortage of water supply which was unable to sustain the growing population. The palace and mosque in Fatehpur Sikri are a tourist attraction and it is an UNESCO World Heritage Site which is about 40 km from the Taj Mahal, Agra. 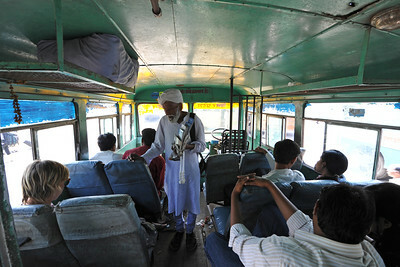 Uttar Pradesh state (UP), North India. 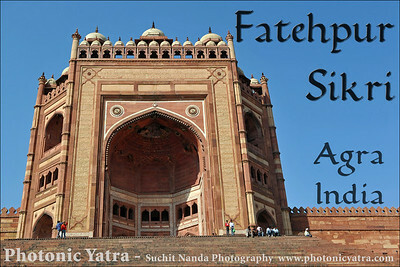 Short video clip of Fatehpur Sikri (Hindi: फतेहपुर सीकरी, Urdu: فتحپور سیکری) is a city and a municipal board in Agra district in the state of Uttar Pradesh, in North India. The historical city was constructed by Mughal Emperor Akbar beginning in 1570 and served as the empire's capital from 1571 until 1585. 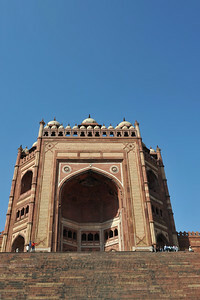 Buland Darwaza: One of the gateways to the Jama Masjid, is a stupendous piece of architecture. Fatehpur Sikri (Hindi: फतेहपुर सीकरी, Urdu: فتحپور سیکری) is a city and a municipal board in Agra district in the state of Uttar Pradesh, in North India. The historical city was constructed by Mughal Emperor Akbar beginning in 1570 and served as the empire's capital from 1571 until 1585. Though it took 15 years to build, it was abandoned after only 14 years of use because of shortage of water supply which was unable to sustain the growing population. The palace and mosque in Fatehpur Sikri are a tourist attraction and it is an UNESCO World Heritage Site which is about 40 km from the Taj Mahal, Agra. 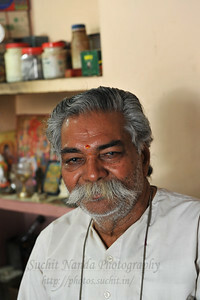 Uttar Pradesh state (UP), North India. 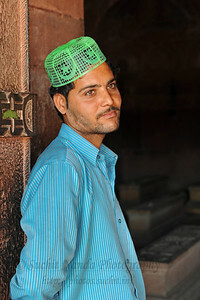 Person who helps those who come pray at the tombs at Fatehpur Sikri. 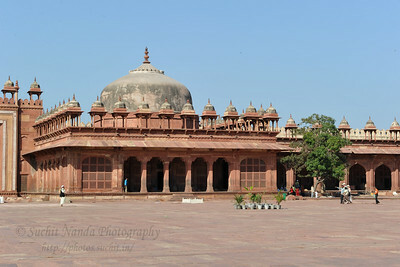 Fatehpur Sikri (Hindi: फतेहपुर सीकरी, Urdu: فتحپور سیکری) is a city and a municipal board in Agra district in the state of Uttar Pradesh, in North India. The historical city was constructed by Mughal Emperor Akbar beginning in 1570 and served as the empire's capital from 1571 until 1585. Though it took 15 years to build, it was abandoned after only 14 years of use because of shortage of water supply which was unable to sustain the growing population. The palace and mosque in Fatehpur Sikri are a tourist attraction and it is an UNESCO World Heritage Site which is about 40 km from the Taj Mahal, Agra. 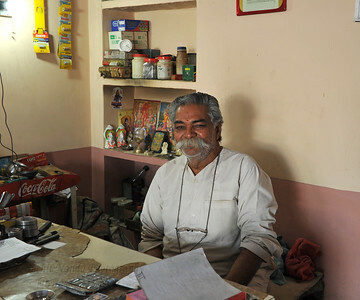 Uttar Pradesh state (UP), North India. 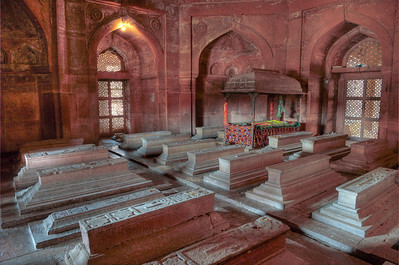 HDR image of Tombs at Fatehpur Sikri. 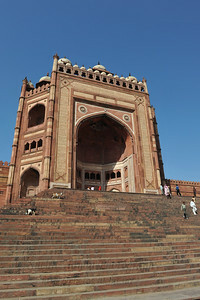 Fatehpur Sikri (Hindi: फतेहपुर सीकरी, Urdu: فتحپور سیکری) is a city and a municipal board in Agra district in the state of Uttar Pradesh, in North India. The historical city was constructed by Mughal Emperor Akbar beginning in 1570 and served as the empire's capital from 1571 until 1585. Though it took 15 years to build, it was abandoned after only 14 years of use because of shortage of water supply which was unable to sustain the growing population. The palace and mosque in Fatehpur Sikri are a tourist attraction and it is an UNESCO World Heritage Site which is about 40 km from the Taj Mahal, Agra. Uttar Pradesh state (UP), North India. Panoramic view of the tomb of Salim Chisti at Jama Masjid. A white marble encased tomb within the Jama Masjid's courtyard is the Tomb of Salim Chisti - the sufi saint who lived as a recluse in the small town Sikri near Agra. 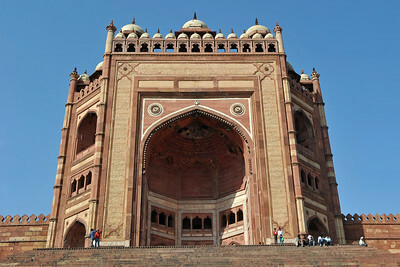 Fatehpur Sikri (Hindi: फतेहपुर सीकरी, Urdu: فتحپور سیکری) is a city and a municipal board in Agra district in the state of Uttar Pradesh, in North India. The historical city was constructed by Mughal Emperor Akbar beginning in 1570 and served as the empire's capital from 1571 until 1585. Though it took 15 years to build, it was abandoned after only 14 years of use because of shortage of water supply which was unable to sustain the growing population. The palace and mosque in Fatehpur Sikri are a tourist attraction and it is an UNESCO World Heritage Site which is about 40 km from the Taj Mahal, Agra. Uttar Pradesh state (UP), North India. 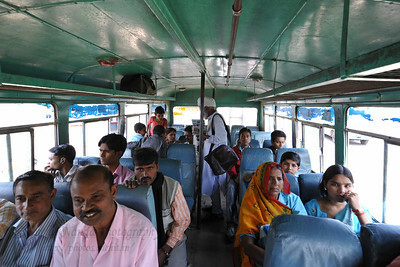 Bus ride from Agra to Fatehpur Sikri which is located about 40 km from the Taj Mahal. Fatehpur Sikri (Hindi: फतेहपुर सीकरी, Urdu: فتحپور سیکری) is a city and a municipal board in Agra district in the state of Uttar Pradesh, in North India. The historical city was constructed by Mughal Emperor Akbar beginning in 1570 and served as the empire's capital from 1571 until 1585. Though it took 15 years to build, it was abandoned after only 14 years of use because of shortage of water supply which was unable to sustain the growing population. 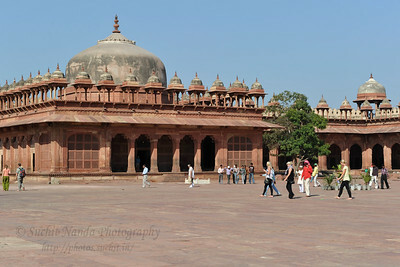 The palace and mosque in Fatehpur Sikri are a tourist attraction and it is an UNESCO World Heritage Site. Uttar Pradesh state (UP), North India. 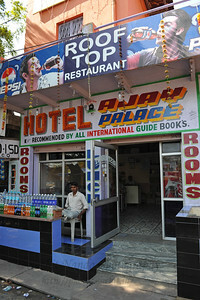 Hotel Ajay Palace which includes a roof top restaurant. Nice food and great service. 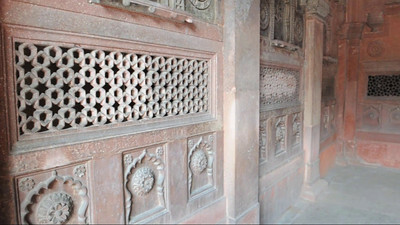 Fatehpur Sikri (Hindi: फतेहपुर सीकरी, Urdu: فتحپور سیکری) is a city and a municipal board in Agra district in the state of Uttar Pradesh, in North India. The historical city was constructed by Mughal Emperor Akbar beginning in 1570 and served as the empire's capital from 1571 until 1585. Though it took 15 years to build, it was abandoned after only 14 years of use because of shortage of water supply which was unable to sustain the growing population. The palace and mosque in Fatehpur Sikri are a tourist attraction and it is an UNESCO World Heritage Site which is about 40 km from the Taj Mahal, Agra. Uttar Pradesh state (UP), North India. 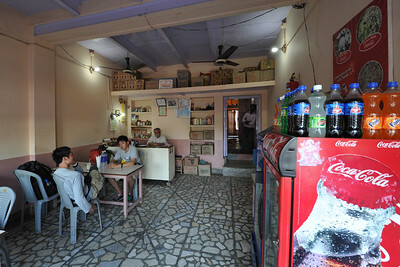 Simple place - Hotel Ajay Palace. This was the ground floor, they also have a roof top restaurant. Nice food and great service. 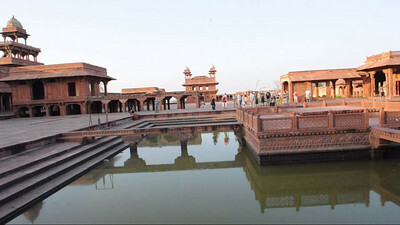 Fatehpur Sikri (Hindi: फतेहपुर सीकरी, Urdu: فتحپور سیکری) is a city and a municipal board in Agra district in the state of Uttar Pradesh, in North India. The historical city was constructed by Mughal Emperor Akbar beginning in 1570 and served as the empire's capital from 1571 until 1585. Though it took 15 years to build, it was abandoned after only 14 years of use because of shortage of water supply which was unable to sustain the growing population. The palace and mosque in Fatehpur Sikri are a tourist attraction and it is an UNESCO World Heritage Site which is about 40 km from the Taj Mahal, Agra. Uttar Pradesh state (UP), North India. 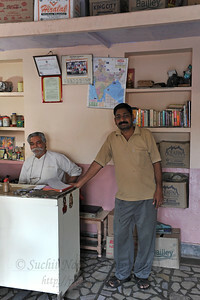 Owners of Hotel Ajay Palace which includes a roof top restaurant. Nice food and great service. 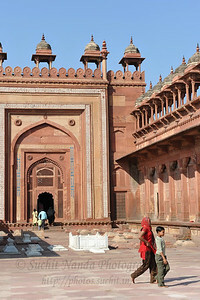 Fatehpur Sikri (Hindi: फतेहपुर सीकरी, Urdu: فتحپور سیکری) is a city and a municipal board in Agra district in the state of Uttar Pradesh, in North India. The historical city was constructed by Mughal Emperor Akbar beginning in 1570 and served as the empire's capital from 1571 until 1585. Though it took 15 years to build, it was abandoned after only 14 years of use because of shortage of water supply which was unable to sustain the growing population. The palace and mosque in Fatehpur Sikri are a tourist attraction and it is an UNESCO World Heritage Site which is about 40 km from the Taj Mahal, Agra. Uttar Pradesh state (UP), North India. 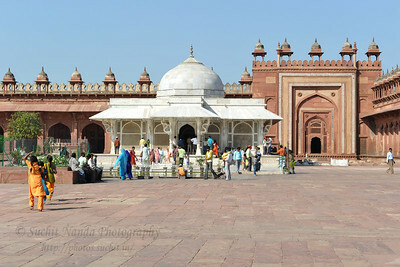 Jama Masjid: The mosque, built in the manner of Indian mosques, with liwans around a central courtyard. 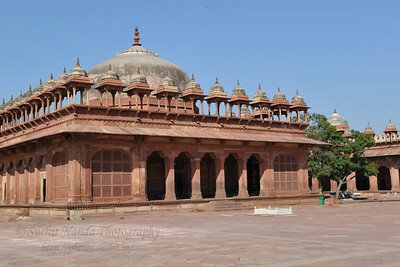 A distinguishing feature is the row of chhatri over the sanctuary. Fatehpur Sikri (Hindi: फतेहपुर सीकरी, Urdu: فتحپور سیکری) is a city and a municipal board in Agra district in the state of Uttar Pradesh, in North India. The historical city was constructed by Mughal Emperor Akbar beginning in 1570 and served as the empire's capital from 1571 until 1585. Though it took 15 years to build, it was abandoned after only 14 years of use because of shortage of water supply which was unable to sustain the growing population. The palace and mosque in Fatehpur Sikri are a tourist attraction and it is an UNESCO World Heritage Site which is about 40 km from the Taj Mahal, Agra. Uttar Pradesh state (UP), North India. 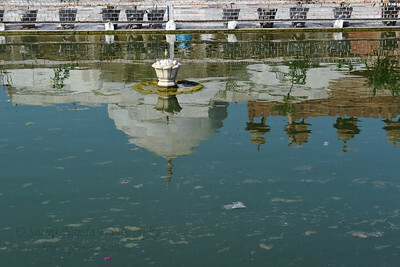 Reflections in the pond of the marble encased tomb within the Jama Masjid's courtyard which is the Tomb of Salim Chisti - the sufi saint who lived as a recluse in the small town Sikri near Agra. Fatehpur Sikri (Hindi: फतेहपुर सीकरी, Urdu: فتحپور سیکری) is a city and a municipal board in Agra district in the state of Uttar Pradesh, in North India. The historical city was constructed by Mughal Emperor Akbar beginning in 1570 and served as the empire's capital from 1571 until 1585. Though it took 15 years to build, it was abandoned after only 14 years of use because of shortage of water supply which was unable to sustain the growing population. The palace and mosque in Fatehpur Sikri are a tourist attraction and it is an UNESCO World Heritage Site which is about 40 km from the Taj Mahal, Agra. Uttar Pradesh state (UP), North India. 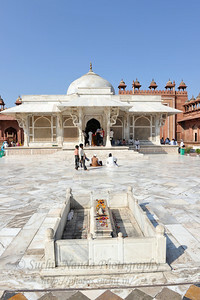 A white marble encased tomb within the Jama Masjid's courtyard is the Tomb of Salim Chisti - the sufi saint who lived as a recluse in the small town Sikri near Agra. 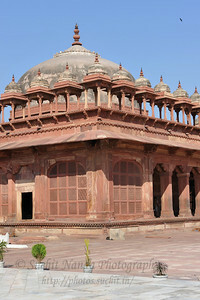 Fatehpur Sikri (Hindi: फतेहपुर सीकरी, Urdu: فتحپور سیکری) is a city and a municipal board in Agra district in the state of Uttar Pradesh, in North India. The historical city was constructed by Mughal Emperor Akbar beginning in 1570 and served as the empire's capital from 1571 until 1585. Though it took 15 years to build, it was abandoned after only 14 years of use because of shortage of water supply which was unable to sustain the growing population. The palace and mosque in Fatehpur Sikri are a tourist attraction and it is an UNESCO World Heritage Site which is about 40 km from the Taj Mahal, Agra. Uttar Pradesh state (UP), North India. 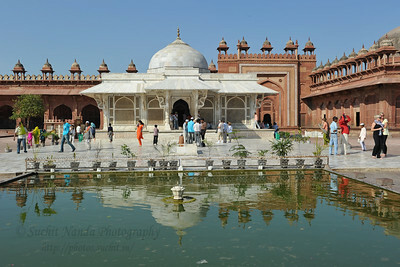 A white marble encased tomb with pond in front within the Jama Masjid's courtyard is the Tomb of Salim Chisti - the sufi saint who lived as a recluse in the small town Sikri near Agra. Fatehpur Sikri (Hindi: फतेहपुर सीकरी, Urdu: فتحپور سیکری) is a city and a municipal board in Agra district in the state of Uttar Pradesh, in North India. The historical city was constructed by Mughal Emperor Akbar beginning in 1570 and served as the empire's capital from 1571 until 1585. Though it took 15 years to build, it was abandoned after only 14 years of use because of shortage of water supply which was unable to sustain the growing population. The palace and mosque in Fatehpur Sikri are a tourist attraction and it is an UNESCO World Heritage Site which is about 40 km from the Taj Mahal, Agra. 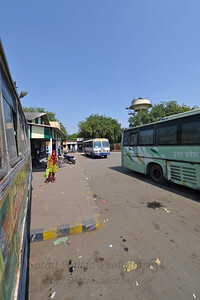 Uttar Pradesh state (UP), North India. Young child getting a first hair cut in the form of a head-shaving in the courtyard of Jama Masjid at Fatehpur Sikri. Fatehpur Sikri (Hindi: फतेहपुर सीकरी, Urdu: فتحپور سیکری) is a city and a municipal board in Agra district in the state of Uttar Pradesh, in North India. The historical city was constructed by Mughal Emperor Akbar beginning in 1570 and served as the empire's capital from 1571 until 1585. Though it took 15 years to build, it was abandoned after only 14 years of use because of shortage of water supply which was unable to sustain the growing population. The palace and mosque in Fatehpur Sikri are a tourist attraction and it is an UNESCO World Heritage Site which is about 40 km from the Taj Mahal, Agra. Uttar Pradesh state (UP), North India. 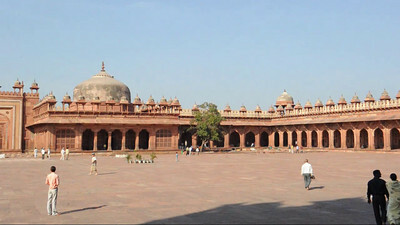 Panoramic view at Jama Masjid. 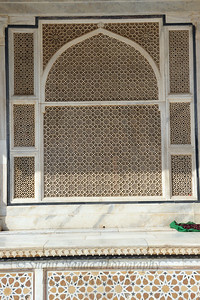 A white marble encased tomb within the Jama Masjid's courtyard is the Tomb of Salim Chisti - the sufi saint who lived as a recluse in the small town Sikri near Agra. Fatehpur Sikri (Hindi: फतेहपुर सीकरी, Urdu: فتحپور سیکری) is a city and a municipal board in Agra district in the state of Uttar Pradesh, in North India. The historical city was constructed by Mughal Emperor Akbar beginning in 1570 and served as the empire's capital from 1571 until 1585. Though it took 15 years to build, it was abandoned after only 14 years of use because of shortage of water supply which was unable to sustain the growing population. 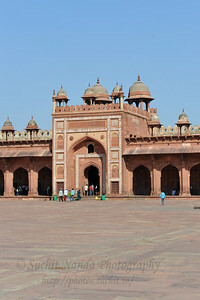 The palace and mosque in Fatehpur Sikri are a tourist attraction and it is an UNESCO World Heritage Site which is about 40 km from the Taj Mahal, Agra. Uttar Pradesh state (UP), North India. Panoramic view of the tomb of Salim Chisti at Jama Masjid. 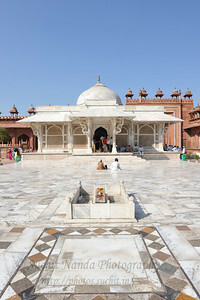 A white marble encased tomb within the Jama Masjid's courtyard is the Tomb of Salim Chisti - the sufi saint who lived as a recluse in the small town Sikri near Agra.